After terrible performances against Ecuador and Colombia, Claudio Borghi is under pressure to keep his job. He is not helped by the fact he joins a full team on the sidelines for the match as Daniel Boyle finds out. 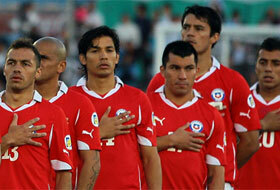 Following the 3-1 loss against Ecuador, Chile need a win to keep their World Cup qualifying campaign on track. Pressure is building on coach Claudio Borghi, who remains suspended after a verbal spray against officials in Venezuela. Joining him on the sidelines is a full team worth of players, out through either injury or suspensions, including captain Claudio Bravo and vice-captain Humberto Suazo. I Love Chile has named a lineup that won’t be taking the field against Messi and friends. Even though there is still 8 games to play, last night’s 3-1 demolition – let’s be honest it was a demolition– handed out by Ecuador felt like seeing your prized Ferrari mis-handled in the garage by a mechanic before your own eyes, prompting the feeling that you may never see it in all its glory again, until a new mechanic is brought in to fix it. There’s a popular feeling that Borghi, spanner in hand, is slowly dismantling a promising side before eventually replacing his spanner for a sledgehammer and obliterating Chile’s Ferrari. The Chile that people fantasise and reminisce about were nowhere to be seen: the eclectic movements; defenders attacking; attacker defending; the frantic football that left your head in a spin, yet you wanted to see more and more. And more. People have to remember it is no longer Marcelo Bielsa’s team. It’s Claudio ‘Bichi’ Borghi’s. But the marriage they didn’t want to end did. Reluctantly, they have had a new partner for a while now and they want it to end. Quick. Despite taking the lead through a ridiculous own goal, Chile never looked comfortable and were soon pegged back through Felipe Caicedo. The same player made it 2-1 after Pablo Contreras was shown a second yellow for bringing down Ibarra in the box; the penalty was missed but Caicedo netted the rebound. Segundo Castillo completed a score line that could, and should, have been more convincing. Chile followed suit of their previous pair of qualifying matches, recovering from a thumping away loss to win by a two goal margin in Santiago. 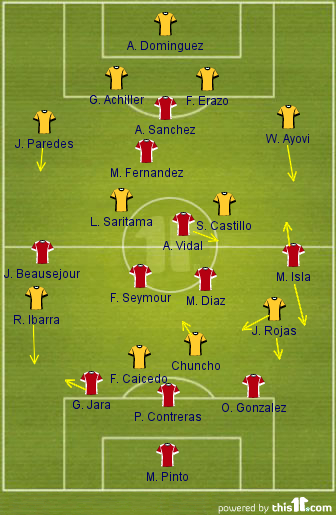 However last nights match was unlike the previous home win against Peru, the game following a simple pattern; attack (Chile) v defence (Paraguay) in the first 45 minutes, Chile score with one of the few first half chances, Paraguay open up in the second half and put Chile under pressure, Chile seal win with a late counter-attacking goal. The game saw little incident and one can only imagine Claudio ‘Bichi’ Borghi was ecstatic that was the case, La Roja keeping their first clean-sheet in eight games. Two changes were made from the 4-0 hammering at the hands of Uruguay on Friday as Marcelo Díaz and Matías Campos Toro made way for Charles Aránguiz and the return of Alexis Sánchez. There was also an alteration in formation, 3-4-1-2 became 3-3-1-3. Sánchez and Eduardo Vargas were stationed wide of Humberto Suazo while Aránguiz played narrow on the left-hand side of midfield. As for Paraguay they set up in a defensive 4-4-1-1 formation, making four changes from Friday’s 2-1 home win over Ecuador – Paulo da Silva, Victor Cáceres, Richard Ortiz and Lucas Barrios were replaced by Julio Manzur, Miguel Samudio, Sergio Aqunio and Julio Dos Santos. Rubin Kazan’s Nelson Haedo Valdez played the lone striker role, tasked with keeping Chile’s three centre-backs busy. He was supported by the deeper Dos Santos and Marcelo Estigarribia who was given allowance to venture forward from the left, but the team’s main task was out of possession to sit deep and get men behind the ball. Claudio Borghi sprang a pleasant surprise for Chilean football fans by recalling Alexis Sanchez to La Roja’s squad for the crucial (they’re all crucial to be fair) World Cup qualifying double header with the Copa America finalists, Uruguay and Paraguay. The Barcelona attacker missed the first pair of matches against Argentina and Peru due to a hamstring injury picked up against Real Sociedad in early September. Event though there is concern from Barcelona, amongst others, about his fitness Borghi had no qualms over calling him up to the 25 man sqauad. Sanchez adds to the already bulging attacking talent at Bichi’s disposal. 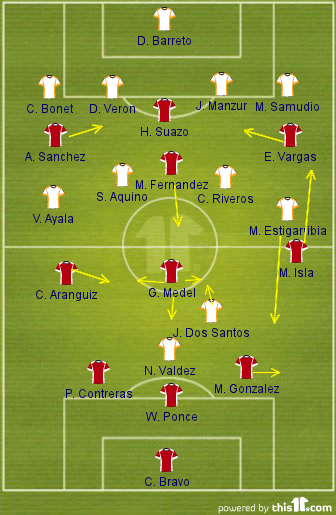 Attacking talent that persuaded the Chilean coach to go to Buenos Aires with three forwards and a ‘No 10’, only to suffer a 4-1 defeat before plundering four goals themselves in a devastating attacking performance against Peru in Santiago. Despite problems in defence and the absence of Alexis Sánchez’s star quality Chile will be hoping to catch Argentina cold in Buenos Aires on Friday as La Albiceleste enter a period of transition under yet another manager. The race to Brazil 2014 starts now – Friday to be precise – for the South American qualifiers. Since Brazil automatically qualify as hosts it leaves the remaining nine countries playing for four and a half slots – the half being the country that finishes 5th, who will enter a two-legged play-off contest against a country from the Asian Football Confederation. With over half of the competing countries potentially joining Brazil at the World Cup in under three years time it is shaping up to be the most competitive qualifying process in South American history, especially when you consider that countries such as Ecuador and Venezuela are no longer considered whipping boys, while Peru are much improved after a fabulous performance at the Copa América.